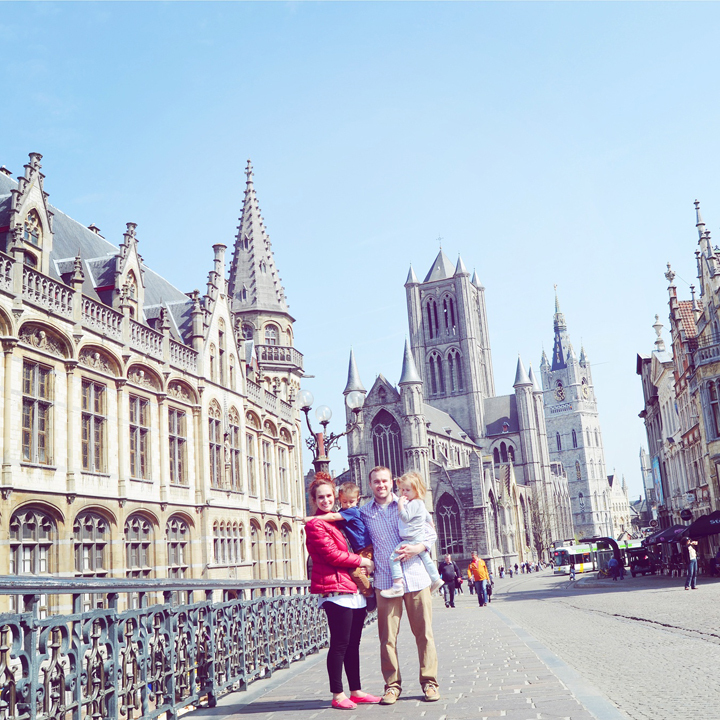 Our second stop of the day: Ghent, Belgium! Kids chasing pigeons - their FAVORITE thing to do, ever, in the whole wide world. Made terrifically wealthy by the textile trade, medieval Ghent was a powerhouse - for a time it was one of the biggest cities in Europe. It erected grand churches and ornate guild houses to celebrate its resident industry. 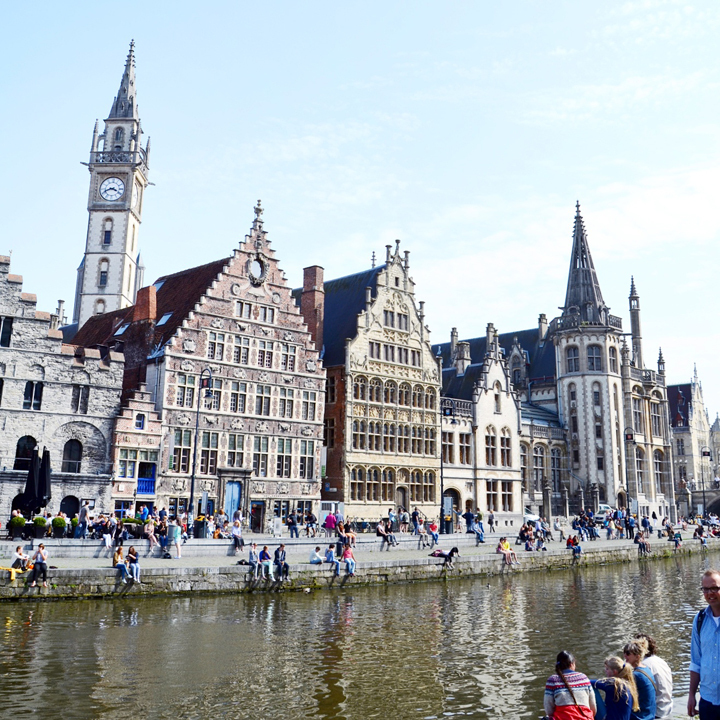 But, like its rival Bruges, eventually Ghent's fortunes fell leaving it with a well-preserved historic nucleus surrounded by a fairly drab modern shell. But, the city is a browser's delight with a wide range of fun and characteristic little shops and boutiques that aren't aimed squarely at the tourist crowds. 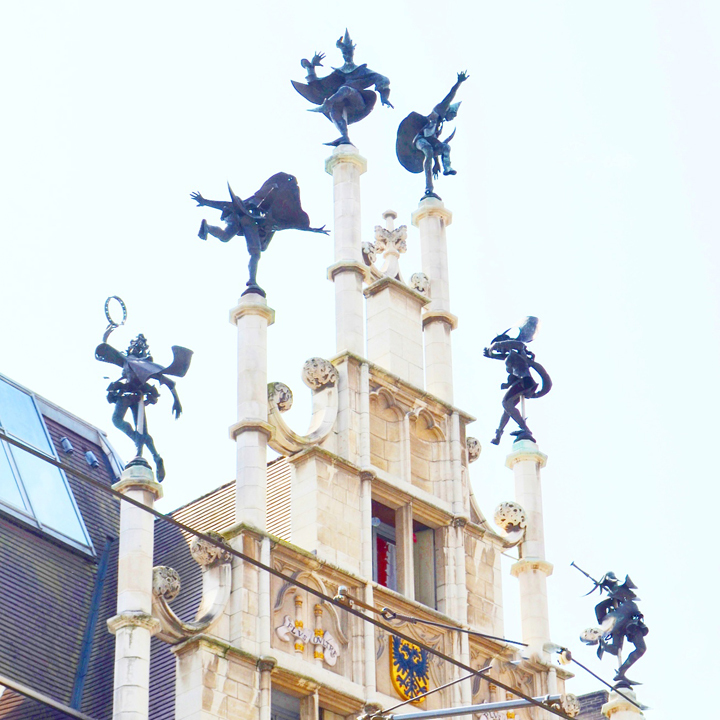 Visitors enjoy exploring its historic quarter, ogling the breathtaking Van Eyck altarpiece in its massive cathedral, touring its impressive art museums, strolling its picturesque embankments, and basking in its finely decorated historic gables. The view from St. Michael's Bridge. Looking down from the bridge we could see the heart of Ghent with the former Post Office building, the Church of Saint Nicholas, the Belfry, and St. Bavo's Cathedral. The Evans Family in Ghent, Belgium on Thursday April 16th 2015. We browsed the Korenmarkt (Corn Market) which is just one of the many small squares throughout the city. While most Belgian cities have one great square, medieval Ghent was too large for that so instead it had a smattering of smaller squares that specialized in different areas of commerce. The squares retain those names today. The Church of St. Nicholas is a stout building made of gray limestone and dates from the Golden Age of Ghent. The building itself is Gothic but the decoration inside is much newer. As this region was at the forefront of the Protestant Reformation in the 16th century, the interior of Ghent's churches suffered at the hands of iconoclasts who stripped Catholic churches of all adornments to unclutter their communion with God. The church was later partly redecorated by Catholics who installed the very Baroque alter. Just down from St. Nicholas' church is the Belfry. Although most of this tower has stood here since the 14th century, the Neo-Gothic top spire was added when Ghent hosted the World's Fair in 1913. The tower was originally built to house and protect the parchment record of Ghent's favored privileges, granted to the city by the Counts of Flanders in exchange for financial support. The dragon topping the spire symbolizes a protector who never sleeps as it watches over the city's rights. It was also a fire watch tower and the carillon in the tower plays the Ghent town anthem at the top of the hour. Down past the Belfry is St. Bavo's square, dominated by the scaffolding-clad Cathedral of St. Bavo. The Dutch Theater is the ornate building on the left and was built in 1899 to provide the town's Dutch speakers a place to perform plays of their own, rather than in French. Inside St. Bavo's Cathedral is the artistic highlight of Ghent, the magnificent Adoration of the Mystic Lamb, often called The Ghent Altarpiece. Painted by Jan and Hubert Van Eyck (Jan picked up where his brother left off when he died), the piece was finished in 1432. This altarpiece represents a monumental stride in Northern European art from Medieval stiffness to Renaissance humanism with a closely observed attention to detail. It's a miracle the altarpiece has survived for almost six centuries. During the wave of iconoclasm in the 16th century, the altar was hidden in the cathedral tower. In 1934 two of its panels were stolen and only one was recovered. During WWII the altar was on its way to safe storage in the Vatican when it was stolen by the Nazis and stored in Neuschawnstein castle in Bavaria, then moved to a salt mine, before being returned by US forces at war's end. Wow! 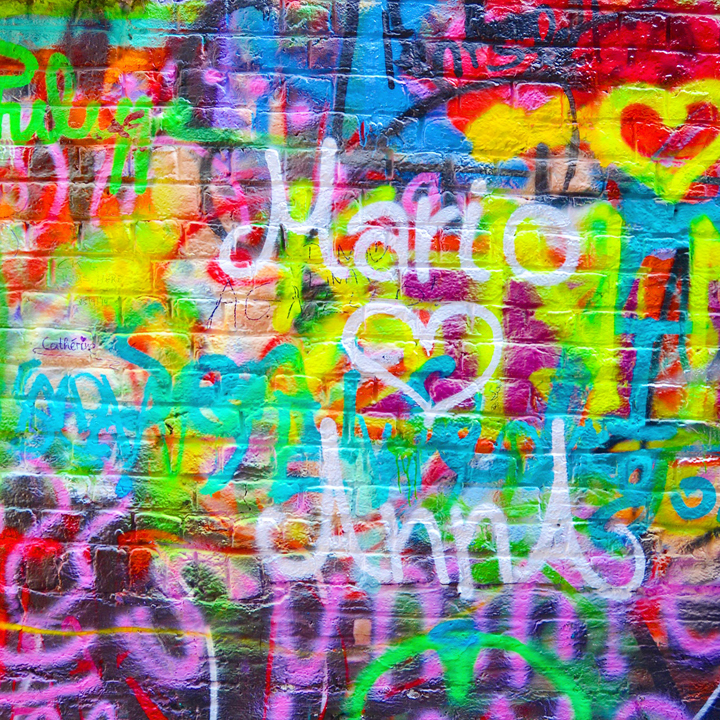 So glad it is still safe and sound to be admired by generations of art lovers. Interior shots of St. Bavo's. Back outside in the sunshine. Hoogport street connects Ghent's two rivers. So charming. A detail shot of City Hall. 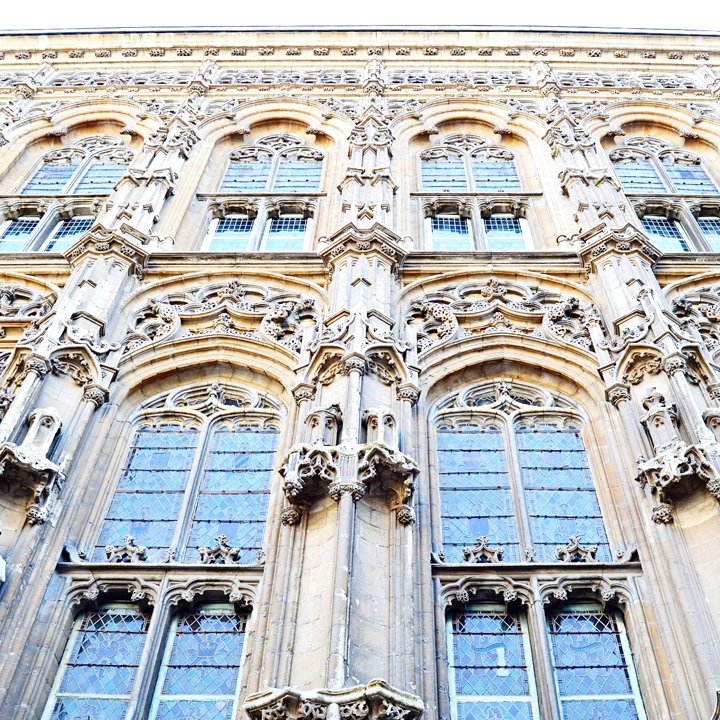 The building is a mix of an ornate Gothic core from the early 16th century with many centuries of additions of various styles. Leaving Hoogport, we ducked down Graffitistraat which is exactly what you'd expect with that name, a street (or alley) covered in city-okayed Graffiti. Fox in front of Einstein. Eventually we emerged into Vrijdagmarkt, Friday Market Square. The statue depicts Jakob van Artevelde, a clever businessman who saved the day in the 14th century when the Hundred Years' War threatened local industry. He negotiated with the waring powers to keep Ghent neutral allowing industry to continue and keep Ghent's economy booming. Baudelostraat, just off the square, has some particularly beautiful gables. Sigh. This is the eclectic "House of the People," the headquarters for the region's socialist movement. Love this tree along the canal. The Patershol district. 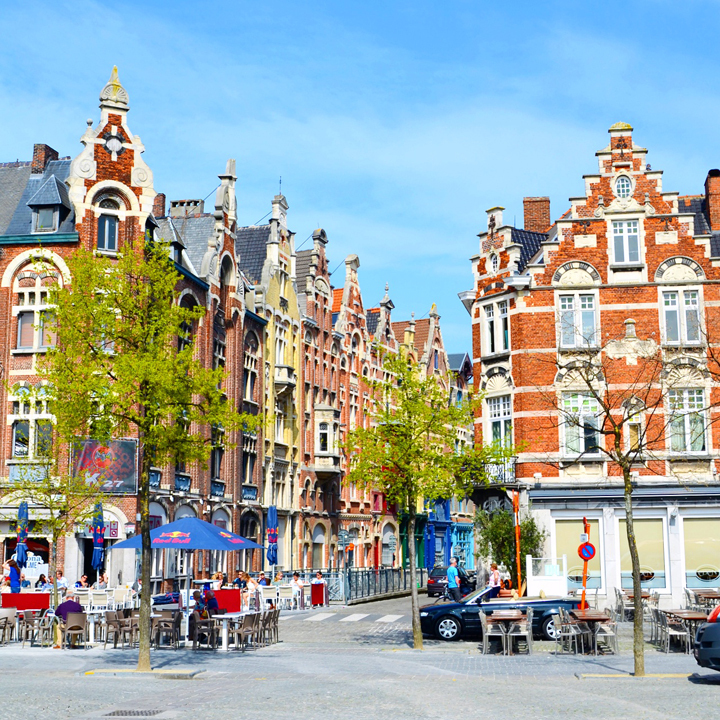 Until recently this was a run-down and dangerous district, today it is one of Ghent's trendiest neighborhoods. 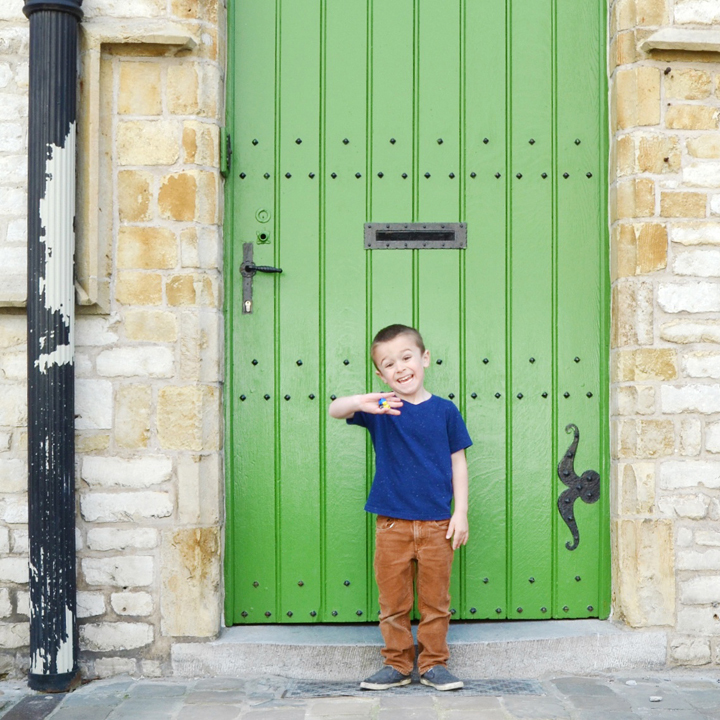 Could Ghent be any cuter? As we walked we got more waffles and fries, of course. We were so happy and content to snack and enjoy the sunshine and beautiful architecture. The Castle of the Counts, built in 1180 by Philip of Alsace. The fortress was designed not to protect the people of Ghent, but to intimidate the city's independence-minded citizens. Looks pretty intimidating to me! Down along the canal near St. Michael's bridge. And what would our exploration in a Belgian town be without a stop at Neuhaus for more chocolates? Those "irresistibles" are extremely well-named, we couldn't resist! After walking around Ghent we drove back to the apartment for the night. The next morning Chris and the kids dropped me off in Frankfurt to teach at KreativWerkstatt. And then two days later my family flew out - many more adventures to blog about!